Infamously referred to as “above the fold,” this mythical space, particularly as it relates to User Experience (UX) on a website, has been the subject of any number of articles. If you’re a marketer, you may have read one or two such articles. If you are a designer though, I would be shocked if you haven’t researched this topic. And I’m equally sure you’ve had at least a dozen discussions on the topic. If you haven’t had this sort of discussion you’ve probably been locked in a deep space cave on Jupiter, making a living designing for Martians. For the sake of this debate, let’s assume we all live on planet Earth and work for humans. Let’s also assume we’re all familiar with ‘the fold’ as it relates to digital marketing success. There are many who argue that the fold is just a myth, and many others who continue to disagree. So where is the truth? As usual, it’s somewhere in between. Why do we even care about the fold? The fold, or more specifically what is “above the fold” was a very important topic and physical distinction of placement for newspaper content. Especially on the cover. Since newspapers were – or are – often sold to customers folded, the top half of the front page was the most valuable real estate. Thus, why positioning a message “above the fold” was/is so important. Sounds absolutely reasonable, right? Of course it does, but how does this carry over to the digital industry? To understand, we have to journey back to the 90’s when the scrollbar wasn’t just a mere indicator as it is today, but legitimately played a very important role. Back in those days scrolling was a real concern; the most important content was purposely placed at the very top of a page, in other words “above the fold”. For a website that translated to anywhere above a pixel height of approximately 768 pixels. Fortunately, we don’t live in the 90’s anymore. Our computers and devices have changed, users have evolved, and we have research that proves that scrolling is far more efficient than clicking. And so we’ve come to it. 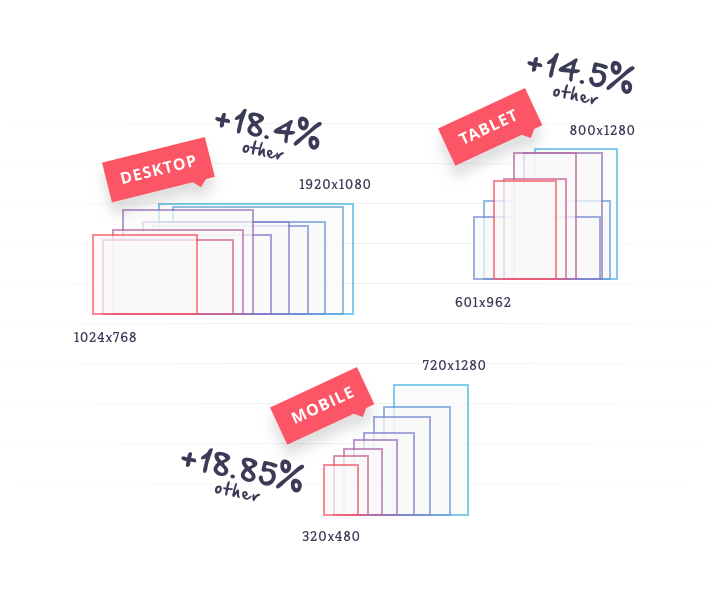 There are far too many potential fold positions to apply an “above the fold” designation that works for all devices, browsers, and screen resolutions. Do They Scroll? Yes They Do! Mostly, marketers are afraid that people don’t scroll. Through research and analytics we know this is simply not true. People do scroll. Even Apple removed the scrollbar (a common indicator of further content) from Mac OS X back in 2011. That was 6 years ago now, so this concept is hardly something new. Scrolling is a natural habit of digital media users in 2017. Imagine going to a real store – your intention is to stroll in and actually take a look around. Is the store clean and inviting or disorganized and messy? If the experience is comfortable and it’s easy to find what you want you’re more likely to stick around and make a purchase. If not, and you’re confused by annoying salespeople and multiple garish signs and displays blocking your way, you’re far more likely to look for the door. Likewise, for a website, all we really need is a strong and clear message and an engaging experience. This convinces users to enter, stay a while, and scroll the page to see further content. It’s really all about comfort and motivation. Higher conversion rates have nothing to do with whether a ‘Call to Action’ (CTA) is placed above or below ‘the fold.’ Visitors take action when they are persuaded to do so – this takes just the right amount of well written copy and appealing imagery within a user-friendly interface. Yes, “above the fold” is a myth. However, the very first message or impression is the most important, because that’s what encourages users to scroll further. Our recommendation is to build trust for users when they land on your page and clearly show the value of your product and/or service. Focus on this, instead of asking them to click something before you’ve demonstrated value. Don’t be too salesy and pushy, because the answer you’re likely to get is “no”. This is what you’re actually doing with a CTA sitting high on your page asking for a commitment without first building any kind of positive rapport. Need help with your website or landing page? Pink Point experts can make even the most daunting projects seem easy. Can Your SEO Company Answer these 10 Questions?